As you may know, I have been working on various project in my kitchen over the past few months. 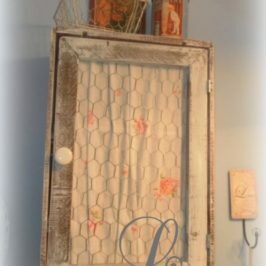 I revamped the cabinets with a new paint job and knobs, I turned one of my upper cabinets into a display piece with some chicken wire and oilcloth, and even created a much needed pantry from some old salvaged doors . After awhile that “old” stainless steel sink started to bug me. I never cared for it. It was time for a replacement. 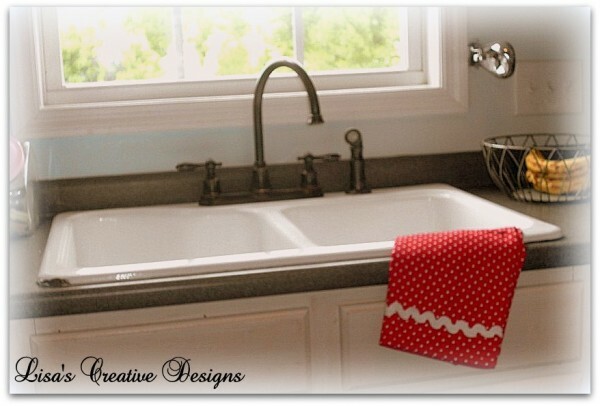 I have always loved enamel farmhouse style sinks like this Porcher London 36″ Farm Sink . With a retail price of over $800 it was way out of my budget. I decided to compromise. 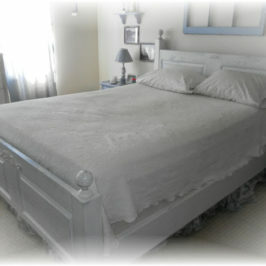 I grew up in a very small vintage bungalow on Long Island, NY. 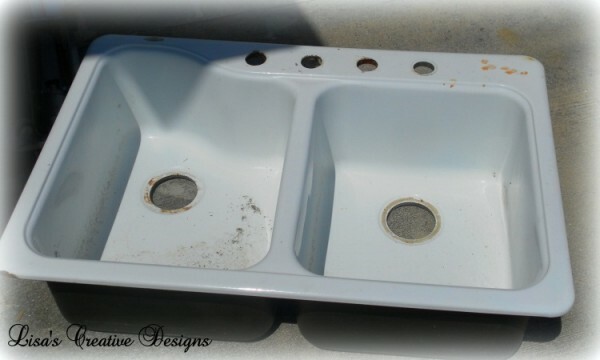 We had a very old, stand alone cast iron kitchen sink similar to this one offered by HistoricHouseParts.com . By the way, this baby sold for $1800! 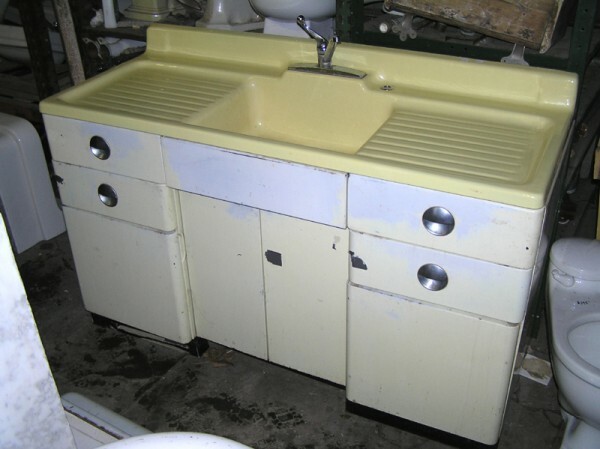 The sink I grew up with was a double sink, just like the one at Grandma’s house. I can remember helping with the dishes after many delicious holiday meals. All of the women would gather in the kitchen on cleanup duty while the men relaxed in the living room. My job was to dry the dishes as they came out of the rinse water. I decided that I wanted a cast iron drop in sink for my kitchen. My husband and I stopped in our local Lowes Home Improvement Store one day to take a gander and the sinks they had to offer. 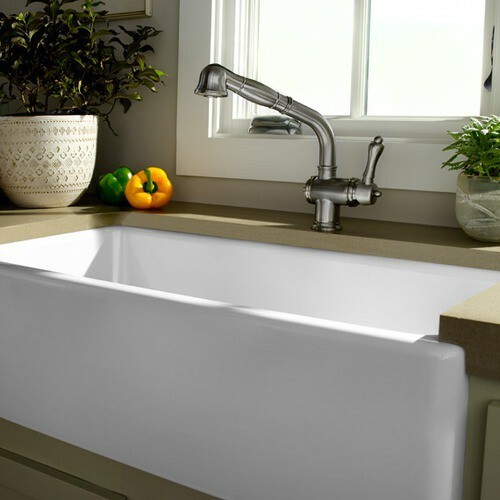 I liked this top mount sink by KOHLER . At $236 it was do-able. 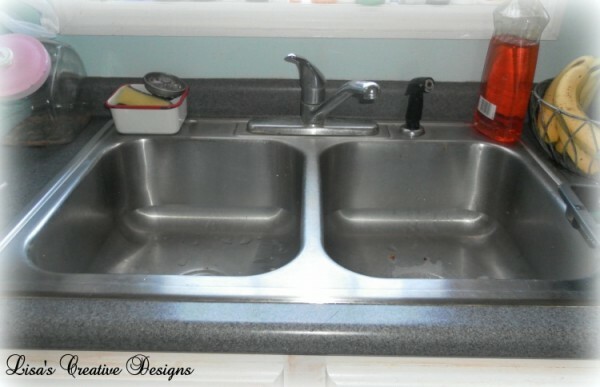 I put it on my mental wish list and went home with plans to have a new sink installed in the near future. That’s when it happened. A couple of weeks later I made a trip out to my Habitat for Humanity Resale Store on a quest for some vintage shutters. Since I was there anyway I figured I should walk over to the check out their selection of kitchen sinks. 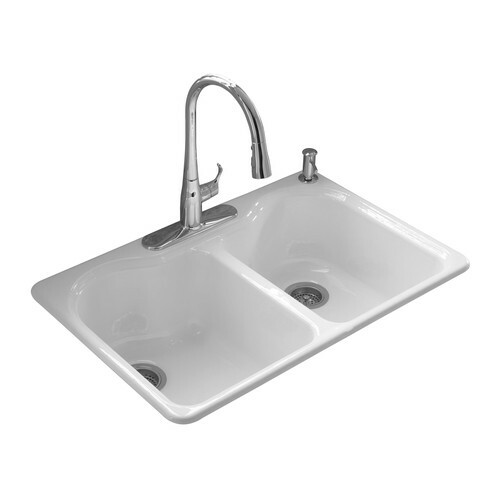 OOOH, I got so excited when I saw this American Standard Double Basin Americast Kitchen Sink. It was a little dirty and needed a good cleaning but I could see that it was in really good shape. Marked at $30 it was a no brainer . Into the back of the van it went. SCORE! So, I got my new sink. Now I needed a new faucet. I couldn’t keep that old faucet now could I? We picked up this goose neck faucet at Lowe’s for $99. Sounds simple enough right? WRONG!!!!! Houston, we have a problem. 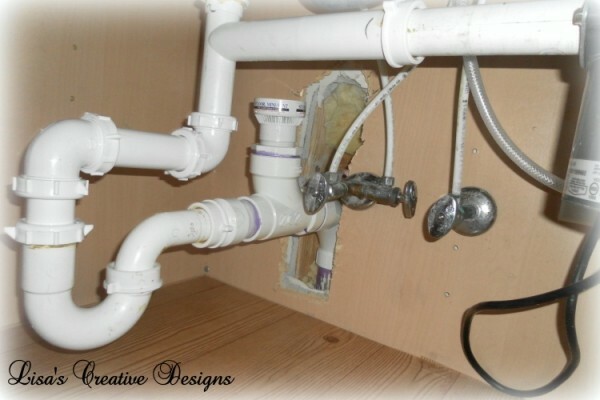 The new sink is much deeper than the old sink and the plumbing was up too high. The bottom of the new sink kept hitting the vent pipe making it impossible for the sink to lay flush on the counter. Good Grief! Lucky for us my Mom and her fiance just happened to stop by. My mom’s fiance was gracious enough to offer help with the plumbing issue. They ended up having to rework all of the pipes, which consisted of replacing pipes and even cutting into the wall, and lets just say it was no easy task. After two days, umpteen trips to the hardware store, a couple of aching backs, stiff knees and a few swear words I had my new sink. Thank you guys! 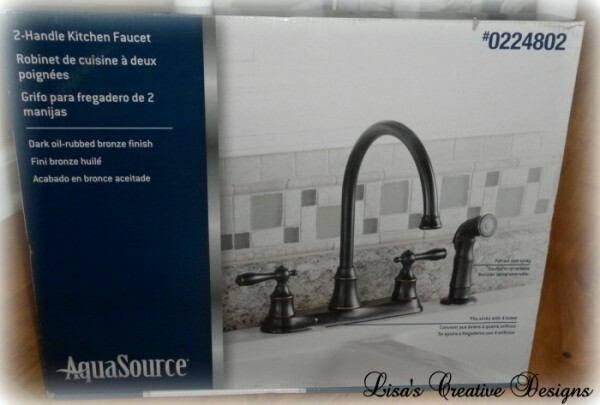 I love my new sink (and faucet)! Sometimes in the world of DIY you run into trouble and are left scratching your head, aggravated and wondering why you started the project in the first place. It’s a whole lot easier just to hire someone (if you can afford it) but you don’t get the same satisfaction once the job is completed!  TIP– Before beginning any home improvement project, check and recheck your measurements! 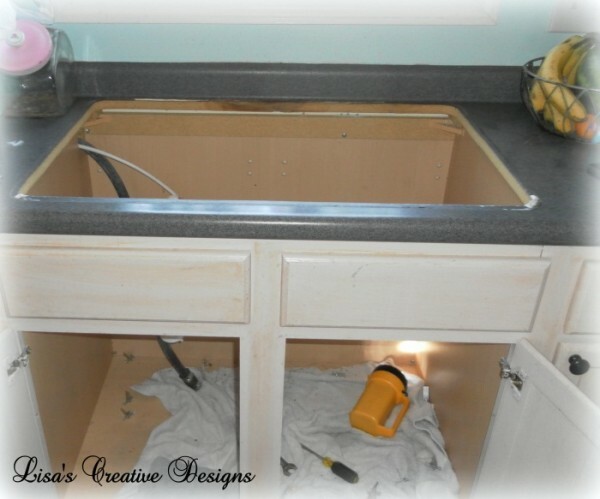 For complete instructions on How to Install a Kitchen Sink Click Here . 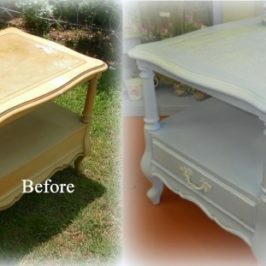 This article my HomeTips.com will walk you through the whole process. 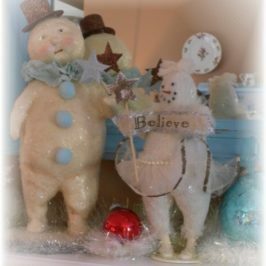 Have you ever started a project, only to realize you may be in over your head????? How did you handle it? On another note, I am almost finished with my master bath re-do. I am on the final stretch and will be sharing that with you within the next few weeks. I can’t wait to see it all finished. Here’s a sneakie peekie…..
Stay tuned! Thanks for joining me today. 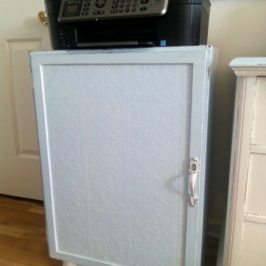 nice job- always enjoy your articles- you should have a DIY show! The sink looks wonderful, It's too bad it was so hard to install, but I'm sure you'll enjoy it immensely, though! Well the finished product looks like it was worth the pain! 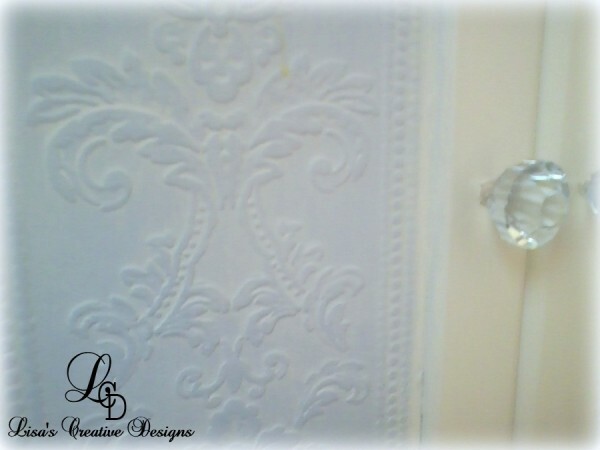 Love your resourceful approach to home DIY, certainly an inspiration to others!